This personal narrative shares the story of a camping trip. We were on the road, and we were almost at the camp when mom stepped on the breaks and we almost hit some squirrel. My heart pounds thump, thump and I was scared. But when we got there bugs were all over the place. But in a couple of days they were dead. Then my cousin had a bike and we rode all over. At nine we played ball. It was asome. Then when we went to slep, and you could hear some birds. When we all got woke up by a noise. So we ran outside and I was scared. Then the next day it was nice. We went swimming. And you could hear the kids laughing. We went to dinner at this place with lots of smoke in it and it smelled. My mom had this thing to eat. It was weird. So then we went back and packed up and left. It was a quite trip all the way back. But I was still glad we went. The Trip to the Woods by Thoughtful Learning is licensed under a Creative Commons Attribution-NonCommercial-ShareAlike 4.0 International License. 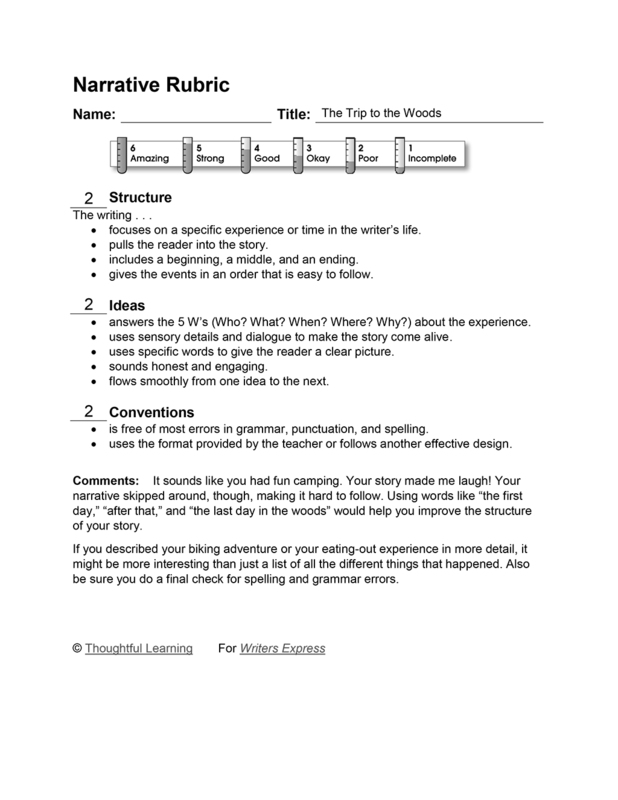 Based on a work at k12.thoughtfullearning.com/assessmentmodels/trip-woods.